Hello lovely IFR readers! Manisha didn't want all of you to feel lonely and neglected while she was in India, so I'm here to prattle on about... cocktail samosas. However, Manisha is still here with us in spirit and certainly in photographs as this is her recipe. I merely followed my dear friend about in her kitchen with my camera while she made these lovely savory pastries from scratch. 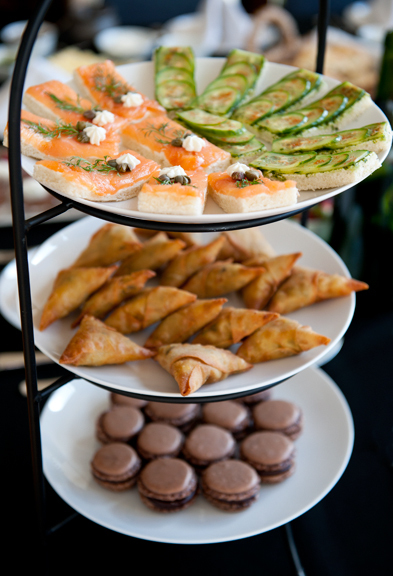 You see, we had a delightful little old afternoon tea a few weeks ago and Manisha brought these phenomenal morsels to serve. So let's get to work, shall we? Manisha made two types of cocktail samosas: potato and chicken. They are both ridiculously fantastic although I lean ever so slightly in favor of the potato because I am crazy for potatoes. If you plan to make the potato samosas (and I highly highly recommend that you do), get the potatoes cooking before you start on anything else. Manisha cooked hers in a pressure cooker, but said that you can also boil them whole. Just make sure they are neither soggy nor overcooked. 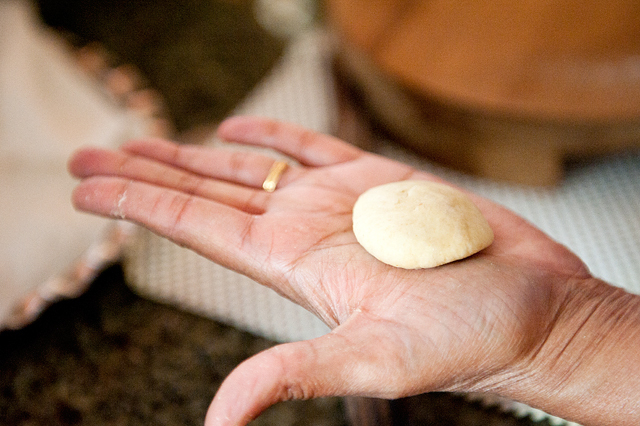 While the potatoes were on the stove, Manisha mixed the dough and formed it into a ball. She covered it with a damp cloth and let it rest until she was ready to work with it. Definitely wait at least 30 minutes. In that time she prepared the fillings. The chicken was so good you could (I could) have sat there and eaten it straight out of the pan. 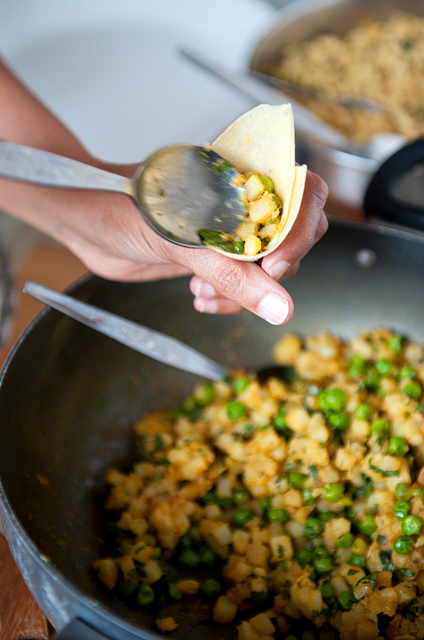 Manisha used ground chicken, onions, ginger, garlic, and spices to create this heady filling. Cooking ground chicken can result in lumps, which we don't really want in the cocktail samosas since they're so small. Manisha pulsed the cooked ground chicken filling in her food processor to achieve a finer grain and then added chili powder and lime juice to taste. Prep for the potato filling was just a tad more involved than the chicken. While I peeled and diced the potatoes, Manisha toasted some cumin and coriander seeds until they were fragrant. Once the seeds had cooled, she ground them up. The rest went quickly: garlic and ginger in oil, then turmeric and cayenne, potatoes, peas, salt, spices, lime juice (you can substitute lemon if you don't have lime), and cilantro. 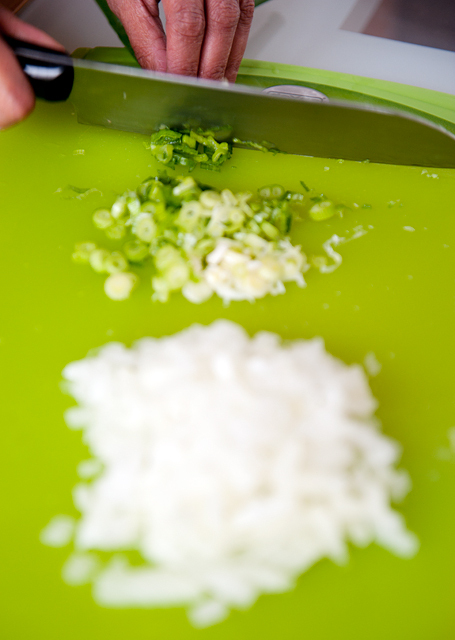 Once it's done, add minced green chilis and more lime juice to taste. Now on to the most involved part of the process - the pastry. 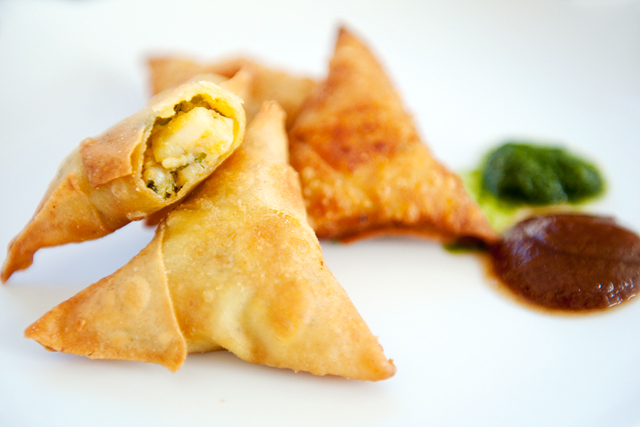 Unlike the more traditional samosas, these have a thin pastry which is really quite elegant! The trick is getting the sheets of dough just right so they are thin enough, but not so thin that they tear when you peel them apart. Manisha had to experiment a little before she nailed it the second time. Honestly though, the first attempt was nothing to sneeze at - I thought the samosas were perfect (and I ate them... several of them... ahem). 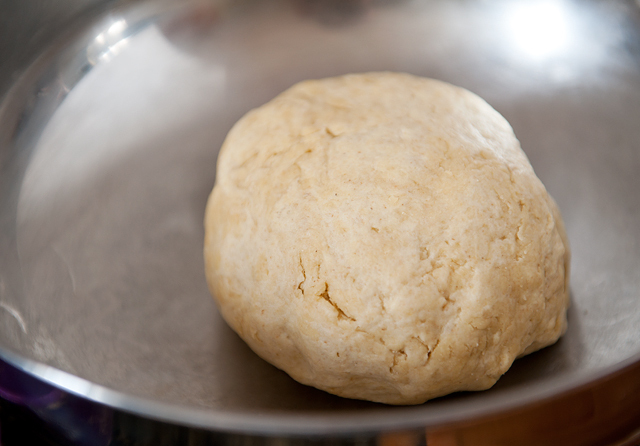 After flattening a ball of dough (you should get about 14 small balls of dough for each cup of flour), dredge it in flour and roll it out in a 3-inch circle. When you have five of these circles, spread a teaspoon of an oil and flour mixture (details in the recipe below) on one of the circles. 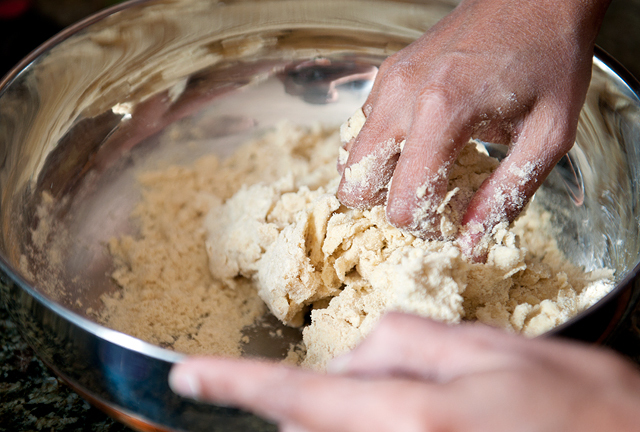 Don't skimp on the oil-flour mixture because using too little will cause your sheets to stick and tear. Stack a second circle on top of the first. Spread another teaspoon of the oil-flour slurry on the second circle and repeat until all five are stacked (don't oil the last one, okay?). Sprinkle some flour and start rolling the stack out until the whole thing is 7 inches in diameter. Be sure to flip it over as you roll it out or else the bottom layers will be smaller than the top layers. Then you toss the whole thing on a hot griddle. Are you still with me?! I know it's rather involved, but the reward is definitely worth the effort. We're almost done. The sheets need only sit on the griddle for 30 seconds before flipping. Keep flipping every 30 seconds and the layers will eventually begin to separate at the edges. Start to peel the outer layer off carefully. Even if the edges tear a little, it's okay because the edges get trimmed. Once you have all of the sheets separated, keep them covered under a damp kitchen towel. When you are ready to use them, slice them in half and then trim the edges to form trapezoids. For each skin, fold the two long corners up toward the middle of the short edge, overlapping them to form a cone. 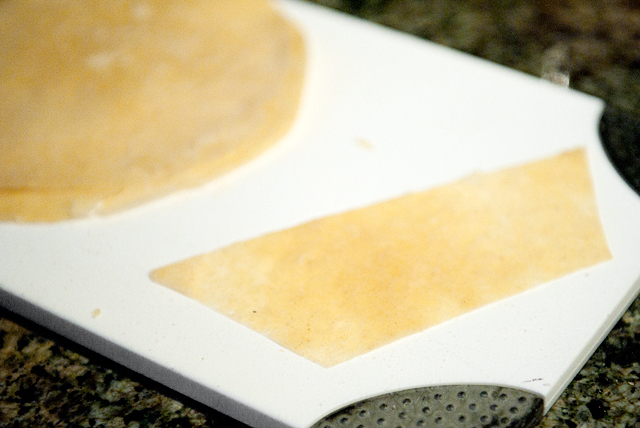 Use a flour-water mix to glue the overlapping edges together. That flour-water slurry is great glue to hold things together, but it also worked well to patch up any holes or tears (I overstuffed the first one). The temptation is to fill each cone as full of the good stuff as possible. I'm here to tell you not to do that. Fight that urge and also do your best to seal out as much air as possible, because your samosa may bust open and disembowel itself in the oil. Be kind to the samosa and fill it to just under the horizontal lip of the cone (or probably a little less than that). 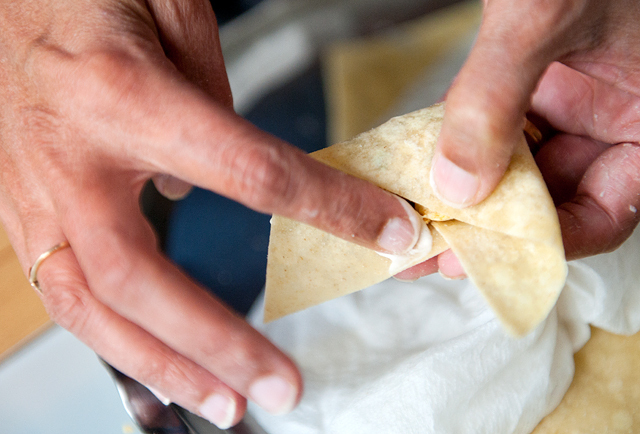 As you finish folding up each samosa, set it under a damp cloth until you are ready to fry. Then fry them to a glorious golden crisp destiny! I have been crazy for samosas ever since I bit into that first one years and years ago. And just like *that*, I have switched my allegiance to the cocktail samosa. Manisha and I stood in her kitchen, each of us with a samosa hot out of the oil. We bit into the pastries, sucking air into our mouths to cool the steaming hot filling - trying to chew while trying to avoid burning our mouths. I couldn't speak. Just a lot of mmmm mmmm mmmms. Indian food so totally rocks my world. Thanks, Manisha! 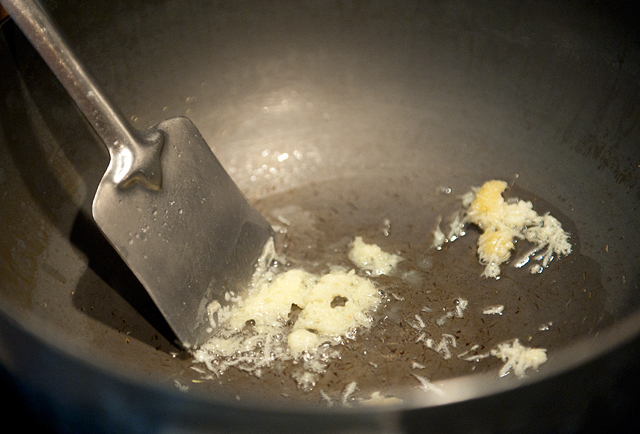 Combine the flour, oil, and salt in a large bowl and mix until it resembles coarse crumbs. Add enough cold water to bind the dough. Knead the dough until it is neither sticky nor hard. Cover with a damp cloth for at least 30 minutes. 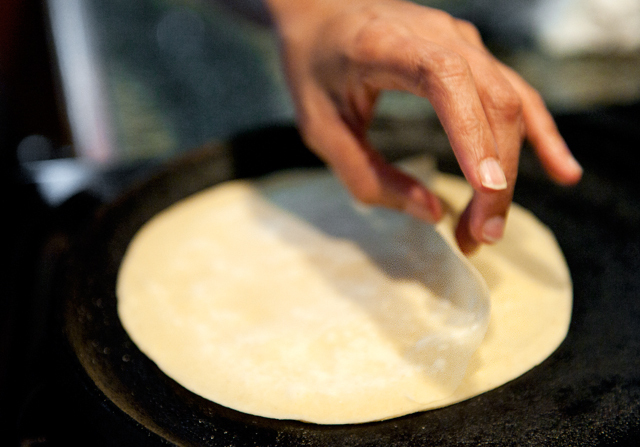 When dough is done resting, heat a cast-iron griddle or pan over medium heat/flame. Pull about a tablespoon of dough off and roll it into a ball an inch in diameter. Flatten the ball and dredge it completely in flour. Roll it out to about 3 inches in diameter. Repeat until you have five of these 3-inch circles. 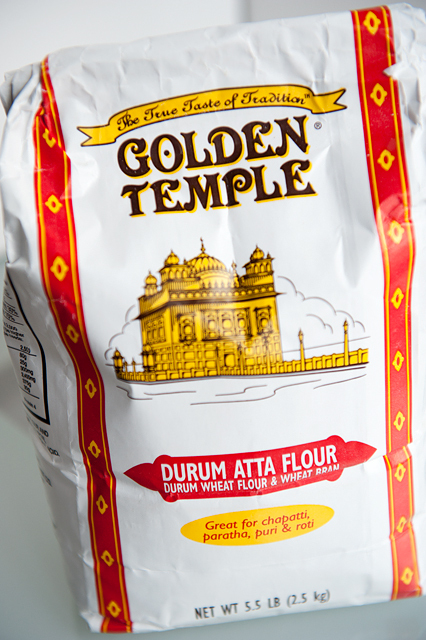 Mix 1/3 cup of oil and a teaspoon of the Durum Atta flour to create a paste. Spread a teaspoon of the oil and flour mixture onto one of the dough circles. Place another dough circle on top. Repeat until you have a stack of 5 dough circles. Sprinkle flour on your work surface and roll from the center out, flipping every so often to ensure the sheets are uniform in size. Roll the entire thing out until it is about 7 inches in diameter. Toss the flattened stack of dough onto the griddle for 30 seconds. Flip the dough over and cook for another 30 seconds. Flip again. If the layers begin to separate, start peeling them carefully. If not, cook each side for 15 seconds longer and flip. When the middle begins to puff up, turn the heat to medium low and start peeling the layers off. They should come off easily and as thin sheets at this point. Stack the par-cooked skins under a damp towel - keep them covered to keep them from drying out. Cut each circle in half and trim the edges to make a trapezoid. Keep the trapezoids under a damp towel until ready to fill. Each cup of flour should yield approximately 14 balls of dough (so 28 pastries per cup of flour). Repeat the process for the rest of the dough. 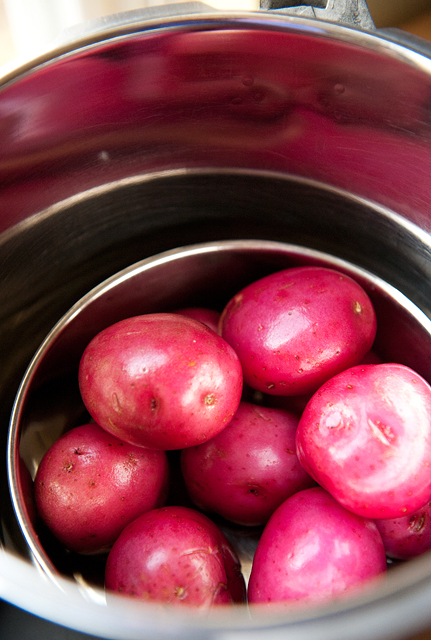 You can boil your potatoes whole or do as Manisha does and pressure cook them whole. 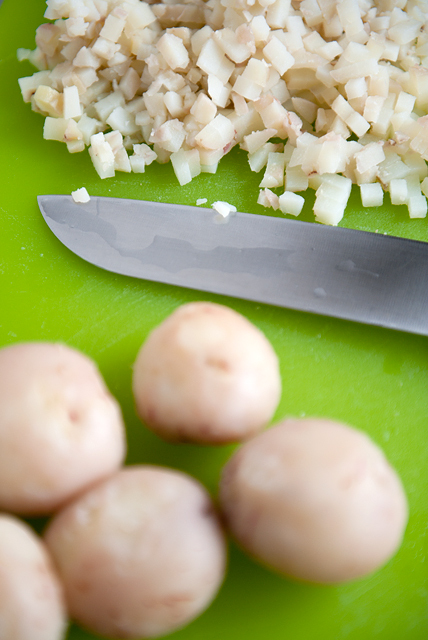 She said the potatoes are cooked well if the skins are not broken and a fork goes through the center easily. On the pressure cooker it is 3 whistles. 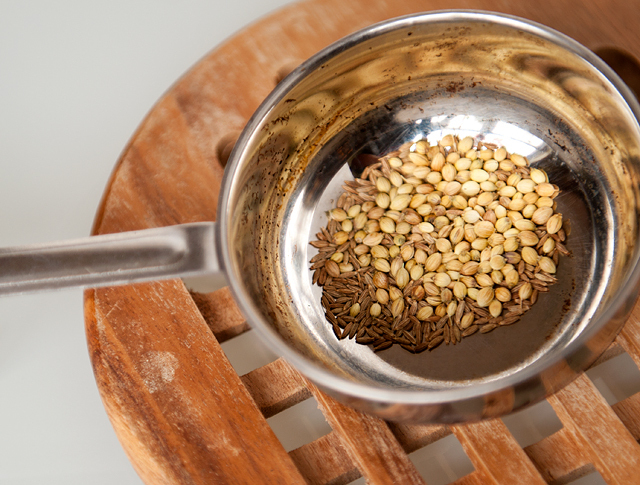 Toast the cumin and coriander seeds in a small saucepan until they become fragrant. Do not brown. Remove from heat and let cool. When cooled, grind the spices. Heat oil in a sauté pan on medium high heat. 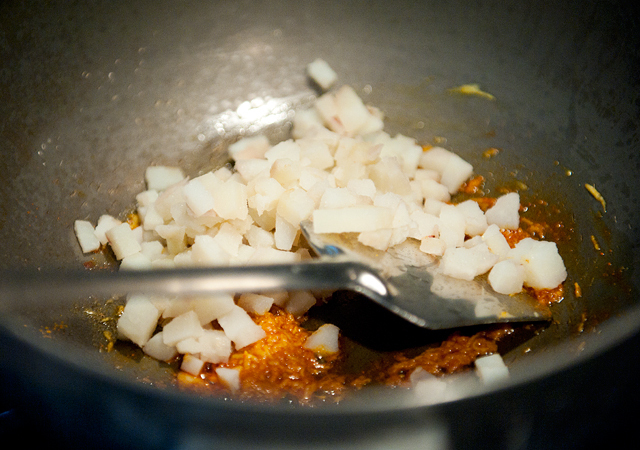 When the oil is hot, add the ginger and garlic and stir about until fragrant. Turn the heat down to medium. Stir in the turmeric and cayenne. Add the potatoes and mix to coat the potatoes with the spices and oil. 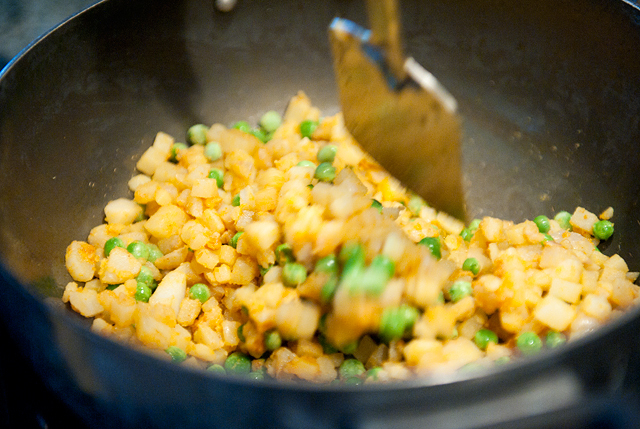 Sprinkle the salt over the potatoes, add the peas, add the ground toasted spices (cumin and coriander), and a tablespoon of lime juice. Mix it all together until the peas are cooked. 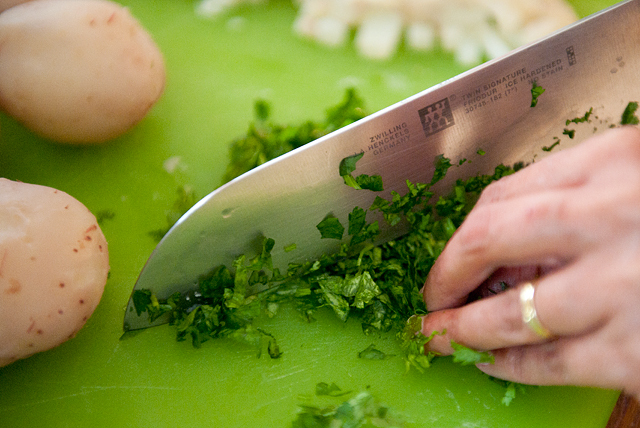 Remove from heat and stir in the remaining lime juice, cilantro, and diced green chiles to taste. Heat the oil in a sauté pan on high heat. 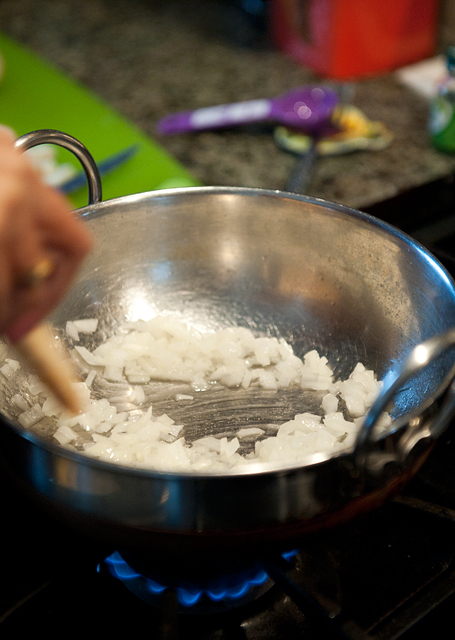 Add the yellow onion and sauté until softened, about 3 minutes. Mix in the ginger, garlic, and salt. 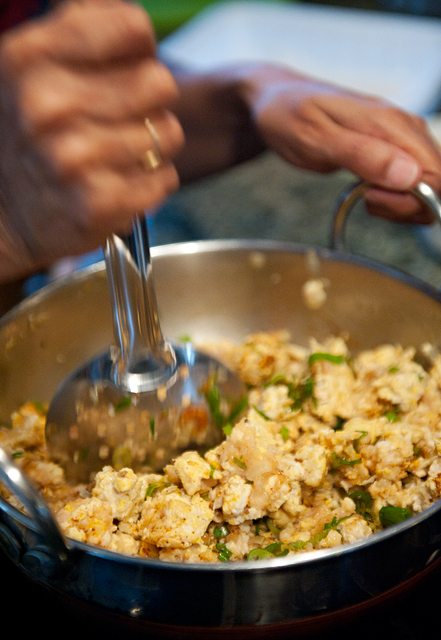 Add the ground chicken to the pan and brown the meat, making sure to break up any large clumps. Sprinkle the turmeric powder over the chicken. When the chicken is cooked, add the green onions and the garam masala and mix together. Add a tablespoon of lime juice and simmer the chicken until the liquid dries out. Remove from heat and pulse the chicken in your food processor just a few times until the clumps are basically ground out. (Large clumps make stuffing the samosas a pain). Stir in the cayenne, remaining lime juice, and cilantro. 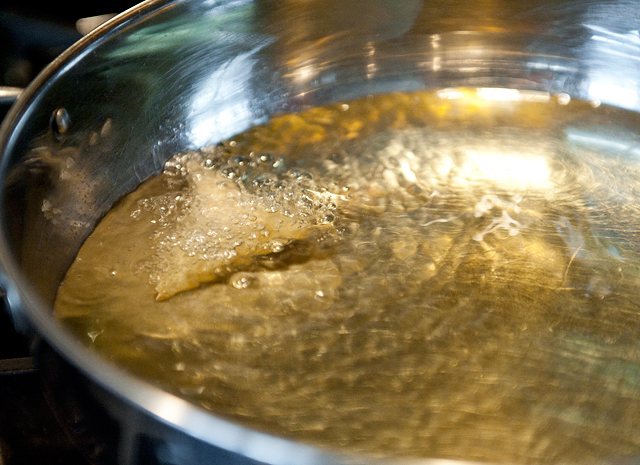 Heat 3-4 inches of vegetable oil over medium-high heat in a medium saucepan. 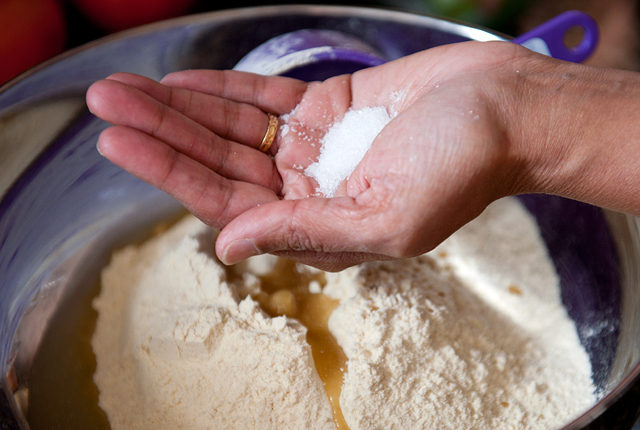 Mix the flour and water together in a small bowl to create a thin paste. Use this slurry to seal any holes and to seal seams. Take one of the trapezoidal pastry skins and fold the two corners of the longer edge up toward the center of the shorter edge. (Is this confusing? Please look at the photos for reference.) Adjust the corners until the base of the cone is closed (i.e. no leaks). 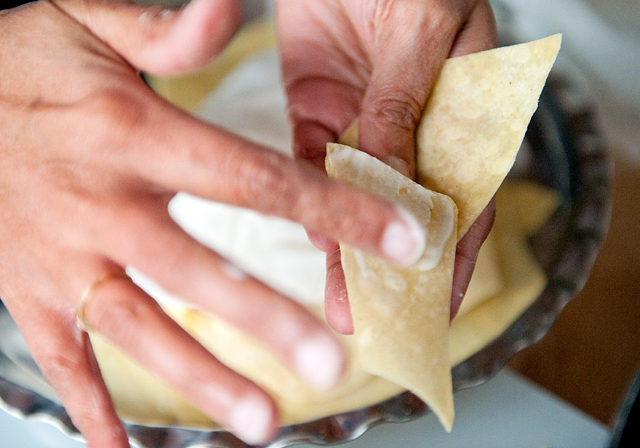 Smear slurry between the overlapping parts of the pastry to seal the cone in place. Fill the cone to just below the horizontal edge with potato or chicken filling. 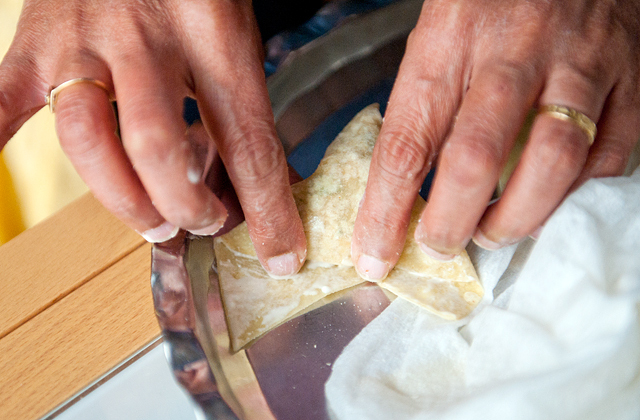 It is important to avoid over-filling lest your samosa should pop open and create a mess during the frying process. 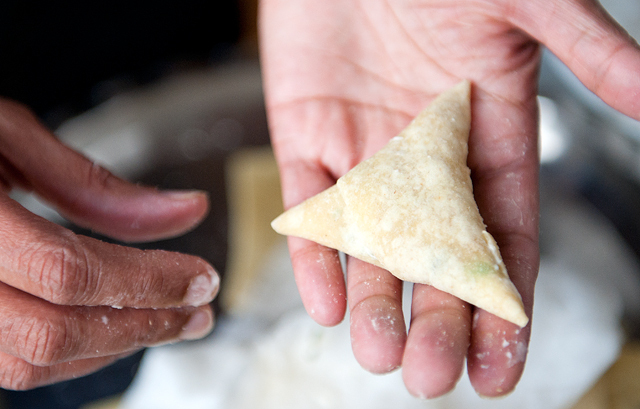 Smear more slurry on the two rabbit ears (the corners protruding out the top of the cone) and fold the rabbit ears down to seal the contents of the samosa into a neat triangular package. If there are any holes or gaps, fill them with some slurry. Repeat for the rest of the batch. When the oil is hot enough (I'm guessing 350°F? 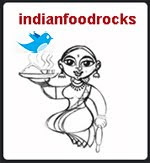 ), gently drop the samosas into the pot. Don't overcrowd! Fry 3-4 at a time. The samosas are ready when the pastry turns a nice golden color. Remove from heat and drain on paper towels or cooling rack. (You will also have leftover filling, which isn't a bad thing... not at all a bad thing). These can be stored in the refrigerator and reheated in a 350°F oven for 5-7 minutes a side. Makes approximately 4 dozen cocktail samosas. Read in FB she is right now in Mumbai, so sweet of you to post for her. Wowo she is pro in making them, i can never make the pastry so think. I am so trying the chicken version. So sweet Jen of you to keep this space kicking! Everything on the snack stand looks droolworthy. Jen those are a special type of samosa called Patti samosa- patti is for strip that encases the stuffings. May we also ask for the savory pastry recipes! Am absolutely smitten by your pictures. what a fantastic collaboration between you two -- this post ROCKS! these samosas were unbelievably delicious and manisha's skills in the kitchen are unparalleled. again, i am feeling like a lucky duck to have been a guest at this amazing tea party! Hi Jen, nice to meet you! :) Hope you're having fun Manisha! Nice to see your guest post here, Jen. And am so glad Manisha introduced you to the samosa. The weather's perfect here, both to make and eat them with a stemaing hot cup of tea. These look really good! I have eaten something similar at my neighbour's but those were greasier looking for some reason. Thanks for bringing this recipe to us, Jen. So gracious of you to do a guest post at IFR! Do you think she might be willing to be the guest-cook when she visits?! Wouldn't hurt to ask, right? I love potato samosas and these samosas are the perfect portion. I cannot wait to use many of your recipes, including this one. very nice post and great pictures. well done, Jen! you are continuing a great and interesting site. i am sure Manisha would be very pleased. loved the details and photos. hope the peace and happiness of Christmas is with you and yours. regards john k, Tasmania. Looks delicious... my only regret is that we cannot smell the aroma while reading this blog post! Wow, with the amazing pix, makes me want to rush off & make a batch RIGHT NOW!! Jen, splendid writing and pics- I enjoyed every bit! 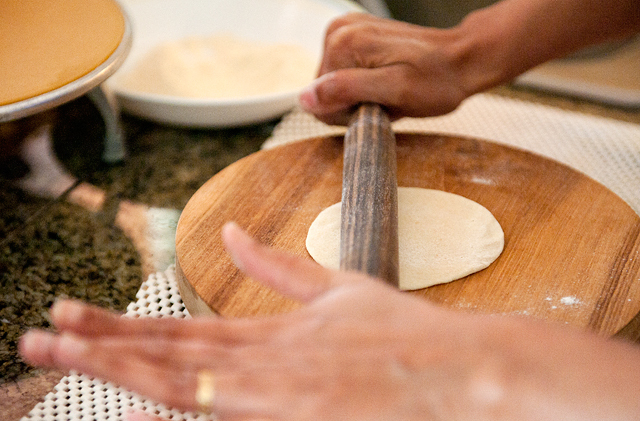 And upon close inspection, I learned two things: 1) a tip for the art of ROUND roti-rolling... and, 2) Manisha, you hold the knife and your other fingers for chopping just like I do... I'm trying to learn the "correct" (French?) 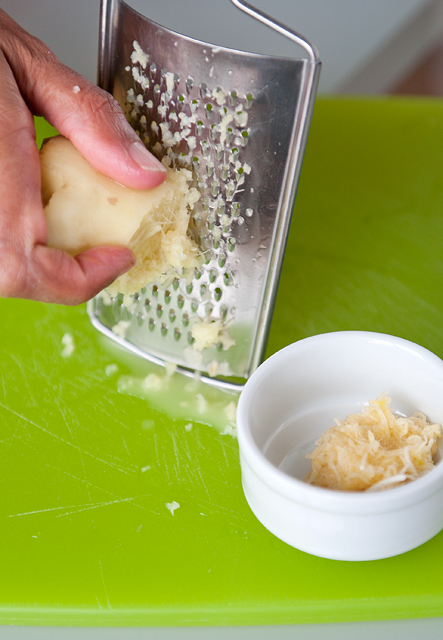 way, but I still find myself doing it exactly this way to get very-precise mincing. Maybe it's fine as long as we don't cut ourselves- and for me it's been awhile! Such a detailed post. Enjoyed it thoroughly! I have a thing for samosas too and I have my own cheater way of doing it. For the pastry, I use frozen ready made popiah skin and usually make samosas when i make chicken stock and pick the meat out of the bones for it. Can the unfilled pastries be frozen for later use? Joyce, they certainly can be. To make them easier to separate, put some wax paper or parchment paper between them. 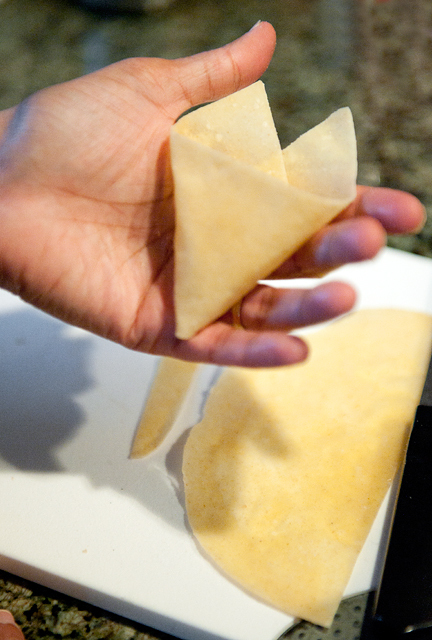 You can also freeze filled samosas and fry them as you need them (without thawing). I tried this samosa recipe. They tasted wonderful. The samosa filling was really flavorful and perfectly spiced. However, I ran into a problem when I tried to freeze them, and then fry without thawing. The center seemed to remain frozen even when the outer cover had cooked to the perfect color. I've never fried anything directly from the freezer before. So, any tips would greatly help. Joyce, sorry it took me so long to get back to you! 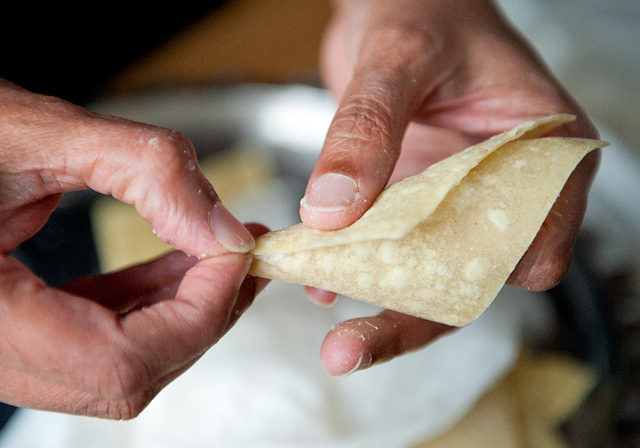 Try frying at a slightly lower temperature than you would if you were fry freshly-made samosas. What that will do is let the stuffing thaw and heat through while the outer shell is fried to a lovely golden color. Fry one samosa first as a test and only then fry the rest. Hey Manisha! This is quite a painstaking process but the end result make it seem worth! Would love to make these mouth watering samosas.